Active Biotech has regained global development and commercialization rights of laquinimod, an investigational immunotherapy for neurodegenerative diseases, including Huntington’s disease (HD) and multiple sclerosis (MS). Click here to read the full article. Huntington’s disease: the price paid for our big brains? This degenerative illness has a few genetic quirks which scientists believe could cause secondary health benefits. Emerging research suggests that people with Huntington’s are less sickly, don’t get cancer as often and even have more brain cells. Hannah Devlin investigates. Click here to listen to the full podcast. For the first 15 years after her father’s diagnosis, while scientists discovered the genetic mutation that causes Huntington disease and embarked on a seemingly endless chase for a remedy, Dardengo avoided the genetic testing that would reveal whether her father’s decline was a preview of her future. Click here to read the full article. Hundreds of Winnipeggers’ engines were revving to help raise funds for the Huntington Society of Canada. In support of the organization, local chapters host their own annual Indy Go-Kart Challenge. Click here to read the full article. 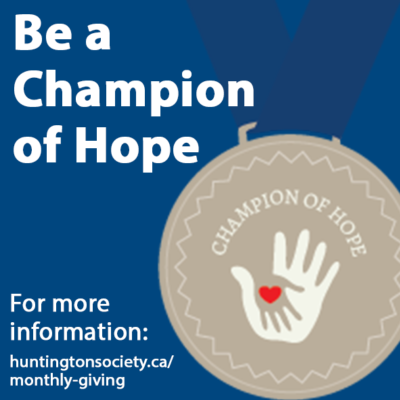 Brett Mitchell of the Winnipeg Chapter of the Huntington Society of Canada talks Huntington disease, support and the Winnipeg Indy G0-Kart Challenge. Click here to watch the full video. 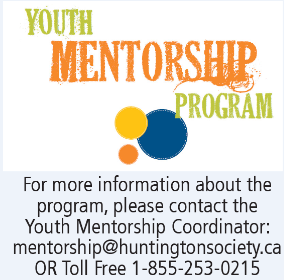 Did you know that with a gift of $25/month you can provide a mentor the support and resources required to mentor a youth from the HD community? Click here to learn more about how you can support through our Champion of Hope monthly giving program. 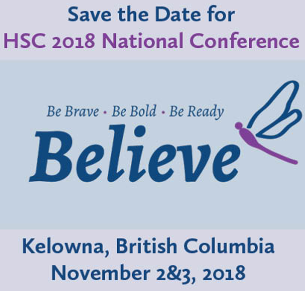 Have you registered to attend the 2018 HSC National Conference in Kelowna, BC this November? Registration closes in one month! This year’s conference will feature world-class speakers addressing the topics of breaking research, current clinical trials, music therapy, animal therapy and so much more. Click here for more information and to register!